Thank you for the wonderful post. My. question is regarding IS-Retail. As you are already aware that RIS functionality has been disabled in 1610. There are certain data that are processed directly into these Info structures namely, data from IDoc WPUKSR (POS Cashier Statistics) are directly posted into Info structure S122, which has now been disabled by SAP. IS there any alternative provided on this by SAP?? 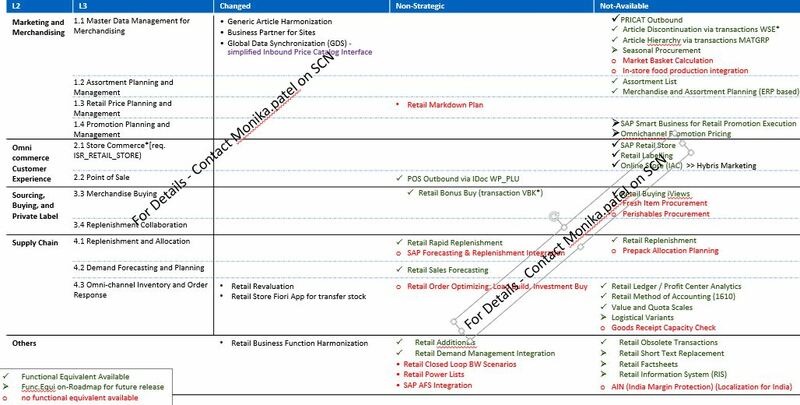 Yes earlier IS-Retail has been disabled in S/4HANA 1610. However few functionalities of RETAIL are available in CORE activation of 4 Business functions), the rest are planned for later release. Based on quick study, I created following mapping/table. – let me know if this was helpful.